Hope everyone had a wonderful Christmas day, and that you are all fit and well, and looking forward to the new year of cycling. 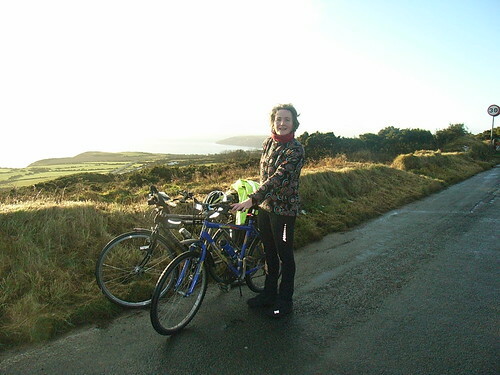 Due to the fact and one, that I keep forgetting about – my other job – that of Mum, Wifie and chief Christmas organiser, I was FAR too busy to get out and about on my bike. Christmas is my favourite time of the year all the same, and so I didn't feel like pulling my hair out as much as I do when I cannot cycle even though had to stop cycling for 7 whole days! We did not get all the lovely snow that many of you managed to get. This meant of course, that despite looking at a dreary muddy landscape instead of a beautiful white one, I did manage to get myself into gear for the festive season. I kept an eagle eye on the weather forecast though, and as soon as my job of 'fantastic food provider', 'house hoover'er', 'dish washer' and general slave was over with I had a cunning plan of an Audax ride set inside my brain for the Saturday following Christmas day. Knowing the adults would be sleeping off the effects of Christmas, and knowing the teenagers would be adding up their pocket money for the ensuing sales in town, I sorted out my final Audax ride for 2009, bring my total Audax rides for this year to 5 (all 100km ones). My friend Paula fancied having a go at this. Brave of her, as she had not cycled more than 20 odd miles in one go. But I knew it would be good to have her company, and besides we had sorted out some White Knights in shining armour should we need to abort part way. I have been a member of Audax UK for a year, and during this time, have learnt a lot about map reading and the skills needed for not getting lost while cycling in the UK. The island where I live is just 15 miles wide and 35 miles at its longest points, but it has about 500 miles of roads on it. So, getting lost here, simply doesn't happen, and getting myself to England (as yet still to brave Scotland, Ireland and Wales) has been a very brave act for a worry wart such as myself. Audax riding has made me take hold of my confidence and give it a proper shaking. Amazingly, I've not once got lost as yet, while out of my comfort zone, and I have had a real learning curve that has quite literally, been a great ride for the scary region of my brain cells. When I learnt that I could sort out a permanent Audax ride right where I lived, I couldn't help myself, I had to sort one out here. Its a bit expensive just Audaxing in the UK, due to the shipping costs. The thought of having a ride here, was too good to miss. So sort one out I did. You also learn even more about Audax riding when you have to sort out a route for total strangers to ride. They have to be able to follow your directions, your distances to each junction and turn within a given time. Plus, it has to be a fun and as attractive as possible. It took me most of the summer to sort out, and I had the ride verified in November this year. Its called 'Celts, Trams and Castles', the name is from the CTC forum, I wanted to use these letters in the name as it was as a direct result from forum users that I learnt about the nature and whereabouts of Audax UK in the first place. So, yesterday, Paula and I set off on this ride. Forecast was for a cold day, with sunny intervals and showers. The start is 6 miles from where I live, so I had an early get up on Saturday morning, leaving the cottage at 7.30am in the dark of course. It had been a hard frost and the gritters had also had a lie in, part of the route into town was walked it was so icy. A half hour ride took an hour. I got my cash point receipt at the Sea Terminal. Douglas was busy, surprisingly, and all the Christmas lights in the town were illuminated. 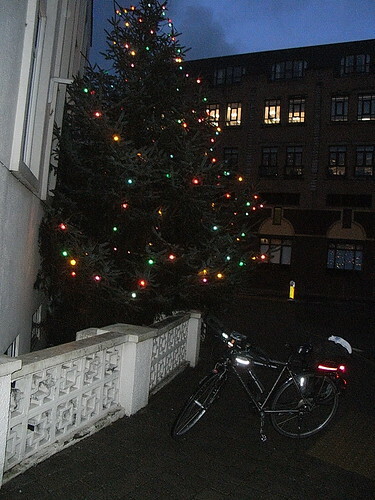 Here is my bike next to the Christmas tree outside the Sea Terminal at about 8am. I cycled along the cycle path which thanks to all the sea water that had crashed onto it was at least ice free that morning. Once the sun started to rise, and to warm the air, the frost was soon to go. I met up with Paula en-route back to Baldrine. She was not going to verify her ride with me, as she wasn't sure if she was going to complete her day. The ride is not a flat one. The island is blessed with wonderful valley's and hill tops. Infact I took my SATMAP with me, as I want to verify the ascents on this ride to try to get AAA points onto it. For this, I need to prove the ascents and SATMAP can download a file which I can send to the Audax organisers for this verification. Here I am, having cycled out of Laxey, the morning sun just creeping cool and dripping out of the Irish Sea. We had our next proper stop at Peel. Having cycled 41 miles to this point, Paula decided to call it a day. She had done brilliantly well. She was riding a mtb without suspension for this run, and it had been the furthest she had ever cycled in one go. We stopped for coffee and mince pies, and at this point, I set off to continue on the ride alone. I had completed and had verified this ride in October, so knew I could still complete within the generous time allowance. The ride out of Peel is a hard slog. When you have already cycled 40 odd miles, on a cold day your legs felt stiff and un-yeilding after their nice tea break. In fact, I think they were a bit jealous of Paula's legs which were possibly rejoycing in their rest, by now in a warm car going home. The 17% hill out of Peel on the Dalby road is on a tight hairpin had bike on her lowest gear, and we slowly advanced the ascent bit by bit. 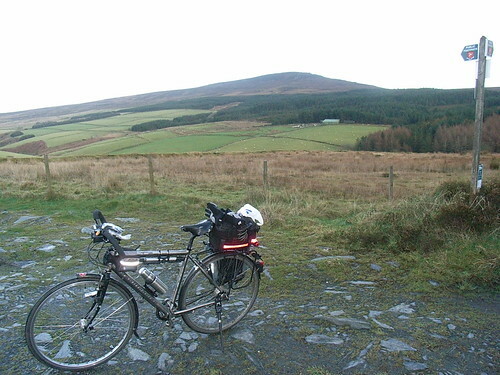 Here is my bike taking a well earned rest part way up to the Sloc road. Finally reaching the top, this is the highest point of the ride. SATMAP suggests it is 315m, from this point it is down hill sharply for nearly 5 miles. The ride down that hill was fabulous, but very cold. Paula and I were very lucky with the weather, but once I was going down that hill, the sky above grew black, thick and cold, and suddenly down came the rain, nicely mixed with snow, just to make it really extra cold to cycle in. I was wearing my night rider jacket, and was warm snug and dry beneath. I was at this point just 20 miles from home, so didnt bother with my water proof trousers. I wear these on my commute to work, but they are uncomfortable on a long ride. Besides a hot bath was getting near. The wind picked up as well making the rain sharp and sore on my face. By the time I was collecting my cash point receipt in Castletown, I was damp, and chilled. 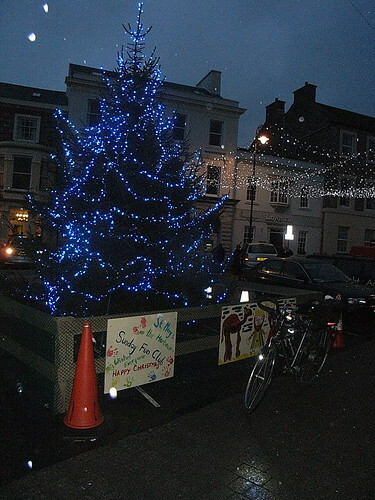 This picture is taken in Castletown Square. Those blobs are not extra moons, but snow mixed with heavy rain. It was also getting very dark of course. The ride takes you along Marine Drive. This is a bit spooky at night, usually I ride it during the day. Marine Drive once was part of the islands road ways, until the sea said otherwise. Taking a huge chunk out of the cliff which included the road way, it was too expensive to repair, so the road was closed to traffic. Railings kept it safe for pedestrians and cyclists though. Nicely traffic free for a good section of the ride home. In total darkness other than my bicycle lights, suicidal rabbits dodged my front wheel, keeping me cycling in the middle of the road. The strong wind became tailward though, as if it knew of my anticipation of my homeward path. 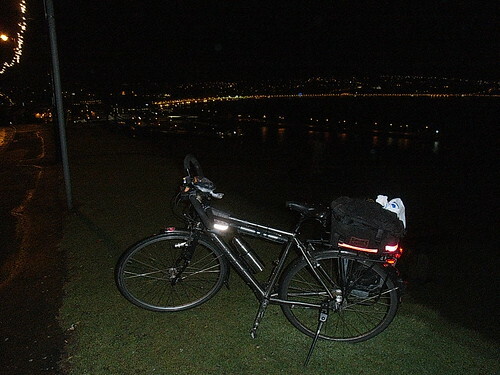 Final picture of my bike over looking Douglas Head, with the lights of the town lit up behind. I managed to get to the final cash point, at the same place as the start – Douglas Sea Terminal within an hour of the cut off time. I was so pleased to be on the final run home. The Audax ride is 105 km, (about 68 miles) but as I had already cycled from home to the start, by the time I got back I had clocked up 80 miles. Felt great, other than a bit cold. It is my intention in 2010 to have a go at cycling 100 miles in one day. Not done that yet. I was pleased to be home. House was empty, as teenagers and husband and visitors were all in the pub! Nice bath, in bed by 8am, and got 12 hours deep kip last night. Looking forward now to 2010. Posted by Mary on December 27th, 2009. Mary, that ride of yours really is quite something. I enjoyed reading your Post. What a great way to spend Boxing Day. I've never cycled 80 miles in one day. I think I'm an incorrigible late starter. The thought of setting out at 7.30 am, even in summer, is too much for me. 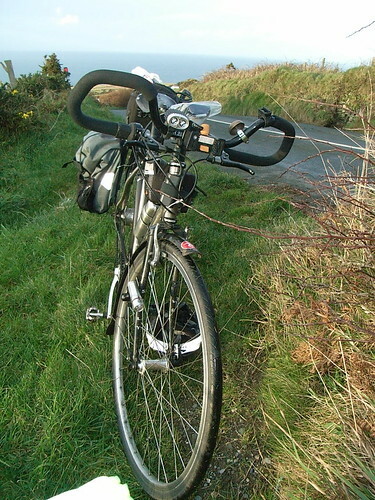 I don't know much about Audax but I also have an ambition to cycle 100 miles in one day, some time during 2010. I know where I'm going, but I'll be setting out no earlier than 9.00 am! Thanks Patrick, I really had a fab ride. The cold made a huge difference to my timing. I did the exact same route in October in just over 6 hours, this time I took 9 hours. I normally start my rides at 9am as well or later to get rid of road traffic, but as I was hoping to get back to Douglas before dark.... well that idea didn't really work did it? I was also riding out with one of my friends initially, and as she is still building up her fitness levels, we only pootled for the first 40 miles. This time last year, I had never ridden a distance more than 30 miles, so its taken me a while to build up to 80, gone through the pain barrier on a number of occasions as well. Good gear on the rear – thats the way to do it! Great post and pictures, Mary. I'm hoping to take my mountain bike on the back of the car up to the Yorkshire Dales tomorrow. I'll be happy to do half your distance at this time of year. I did just over 80 miles (to Whitby) on a tourer in October. I only managed to take one picture that day – before I'd even got to the starting point of the CTC's day ride – and the rest of the time I was too, er, fatigued, to stop and take any more. It was a head down job; I hoped to get there in daylight, but couldn't. Will check in morning if my flask fits my bottle cage!